Joseph “Caden” Wright from Poston Butte High School, is ranked 9 out of 395 students and have has maintained a 3.95 GPA. Caden was elected to be the Secretary of the National Honor Society, and has helped with other clubs, such as, Link Crew and Blood Drive. The Leadership skills he gained from those clubs helped him in sports, where had been chosen to be the Captain for Cross Country and Track for two years, and Soccer for one. After receiving the Varsity letter his freshman year, he continued for his next three years. In his Senior year, he broke 2 school records, and potentially can get 2 more. 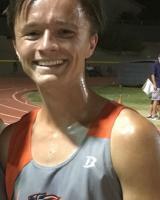 He owns the school’s 5k record with a 17:06 and a recently broken 4x1600 record where his team broke the record by nearly a minute. Caden is also volunteer Soccer coach for little leagues to help the kids learn how to play, and how to grow a passion for the game. Caden will be going into the Medical Field at either Northen Arizona College or Ottawa University.